It’s Back – The Agggggg-pprentice! 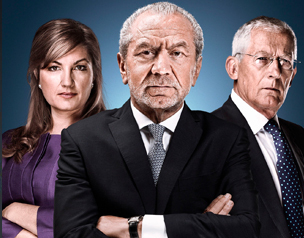 Oh yes, it has returned, the BBC Apprentice with Lord Sugar and his cohorts. I am not sure yet whether to laugh or cry. I always say I am determined not to watch. If one programme needs a health warning for blood pressure spikes, then this is the one. I find it hard to put into words how irate I can become with some of the unfounded arrogance, the rudeness and the general idiocy of some of the people we end up watching. So you ask, why do you watch it? Well, how else will I get to spike my blood pressure, shout at the television and laugh until I think I will choke without watching the Apprentice? And therein lies the rub as they say. The problem with the Apprentice is exactly what makes it watchable. It is an entertainment show masquerading as a reality business show but we know it is for laughs, don’t we? It is the best and worst of ‘car-crash’ television. The best because we all get to shout ‘Don’t do that’, ‘Call yourself a salesman’, ‘What age are you lot, 3?’ and other favourite phrases. It is the worst because some people may believe that this is the way to ‘get on’ in business? I hope this isn’t the case but worry that there are some young folks out there who would regard some of the contestants as role models. Please don’t let this be the case…. So, what do I like about the Apprentice? I love a good laugh and you can’t deny that the programme will give you plenty of those. You also have to enjoy Nick and Karren show. I do miss Margaret, she had ‘the look’ down to a fine art but I have been very impressed with Ms Brady’s abilities to get to the heart of the numpty behaviour. My favourite moment from the last series was when Karren took some of the contestants to task after they rowed outside a shop. She berated them for their total lack of professionalism and maturity. They squirmed and they were right to squirm. I was so glad to see their childishness being addressed with a cool dose of common sense. I also love the complete lack of organisation from those who regard themselves as the cream of business. I know that they live and work together in a hothouse environment where you can get carried away but sometimes it has more than a touch of the Keystone Kops about it. It beggars belief that all of these ‘brains’ can make such dumb decisions. However, isn’t that the reason we can tell ourselves that we could do better? And that is the last reason I love this show. It makes all of us feel better, we can believe that if we decided to got for it then we would be so much better. Unfortunately, I also assume that we would get caught up in the whirlwind of business-speak and nonsense and we would be as dumb as we perceive them all to be…..
That was the ‘good’, now what about the bad? The first one is simple, bad manners. For a programme that tells us it focuses on professionals, we see rows, name-calling, speaking over each other, all-out nastiness and arrogance. Some of the behaviour I have seen has left me speechless and appalled. The after-show has the merit of showing the fired contestants some prime examples of this behaviour. I am glad when they have the good grace to be apologetic about this. I wonder if any of them learn that making yourself look good doesn’t mean that you have to make everyone else look bad but I really hope they do. Then we have the language. Not swearing, I can take that. I mean the business-speak. Oh my word, what nonsense some of them speak. I work in business, I know the jargon and have had occasion to use it. However, it is not a competition (though it might be bulls**t bingo, go ahead and google that!) but some contestants can only speak in gobbledegook. Who do they think they are kidding? I get to the stage where I think ‘Oh bless’ when some of them speak complete tosh and look so proud of themselves. They really don’t have a clue sometimes. So, to Sir Alan, I wish you the best. Your analysis of the team contestants tends to be on the money, you know what you want and what you want to achieve. I enjoy the madness, I sometimes wonder if you do, we wish you luck and hope that on your journey you will give 110%! Well, I couldn’t resist…..
PS! My favourite quote so far – ‘I am very sorry that I underestimated the manpower required to squeeze oranges’ – what can I say?